Mandela: Long Walk to Freedom. The film screenplay by William Nicholson and directed by Justin Chadwick is a powerful movie highlighting the struggles and journey South Africans faced from as early as 1942 to the 1990’s. The story of this time can be captured in the tale of one man and what he went through to achieve peace and freedom for his nation. 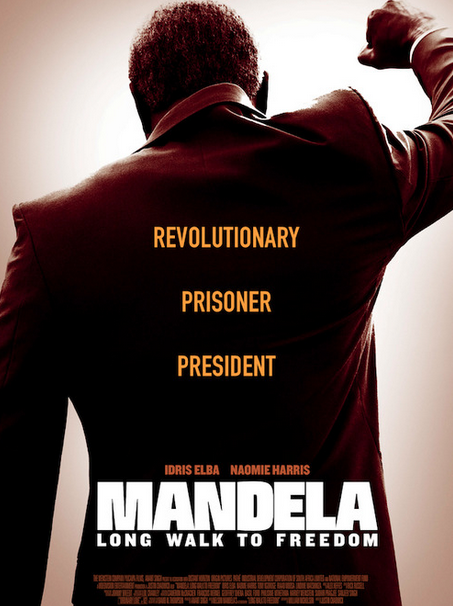 Mandela (Idris Elba) was the face and voice for the ANC, the party who fought for the people. The movie provides us with a unique way of coming to understand and educate us on the events that took place. Naomie Harris delivered a standout performance as she embodies every ounce of power and drive portraying Winnie Mandela. The scene where she walks out of the courthouse and greets the crowd with a powerful motion and yell, was so dynamic. The use of songs and chants within the film really drives the movie, as well as the message. I would have loved more of it in certain scenes. The singing created a sense of unity that really captured the essence of the film. The film also showed two sides of Mandela, negative and positive. There is the understanding that in the fight to save his country both he and his family suffered. There is the knowing that he did so, for his family and for future generations, and that in the quest for freedom alone you are a voice and together you hold the power. This was seen in many forms, within his family and the ANC. The cinematography in this film is absolutely beautiful. The opening shots are vibrant and the colours present create this sort of ethereal dream like quality, followed throughout the film whenever Mandela visits his hometown. The imagery is quite important in the film. There is a stark contrast between the country and city landscapes that creates a sort of symbolism to emphasise the situations in the film. Representing the difference in the natural surroundings of the country, light and colourful, in a stark difference to the harsh dark colours of the city scenes. Watching the film in VMAX definitely heightened the experience of watching such a film. The rally and crowd scenes where they sang and close ups such as the scene where Winnie received word that Mandela was arrested really captured my attention. It’s been a while, but as the credits rolled alongside images of Mandela, accompanied by the award winning song Ordinary Love by U2, the audience clapped. What is YOUR Valentine’s Day movie?